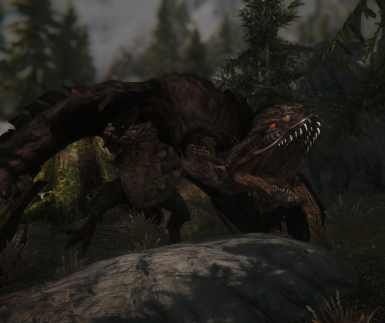 Adds dozens of new creatures and monsters to Skyrim. 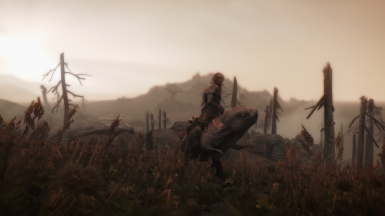 The mod's main goal, aside from adding a more diverse range of fauna to Skryim, is to also add as many creatures from ES lore as possible and give hunters a truly wide range of prey to fight and hunt. Under no circumstance are you allowed to use this content without seeking permission from the authors of this mod first and letting them know what you wish to use them for. If permission is approved, credit must be appropriately given to everyone involved in this mod, so credit everyone listed in the credits if permission is given. See the Credits section on the mod's Description page. Accidentally uploaded v5.1 scripts in v5.2. This is now fixed. If user has SKSE, overfilled leveled lists will be detected and prevented. Current Issues: When killing certain new farm animals, it will not count as a crime. Reduced number of spawns in certain camps. Added new pie recipes and one new ingredient. Fixed combat behavior for the wardens in The Chill. Added new abilities to certain creatures. 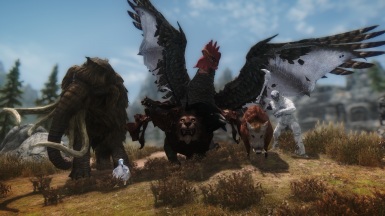 A brand new monster mod featuring many new creatures, ingredients, sights and summons! Now fully configurable through MCM or spellmenu! Adds over +100 new creatures and just as many ingredients for every new creature as well as some new vegetables. It also adds plenty of miscellaneous trophy items you can harvest from these creatures, such as horns, skin and whatnot. 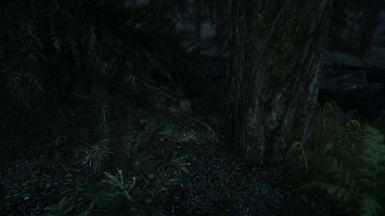 The creatures themselves are rare and don't appear to often except for those that have already been placed in the overworld. They don't replace any vanilla creatures and have their own spawns but can appear in vanilla spawns. 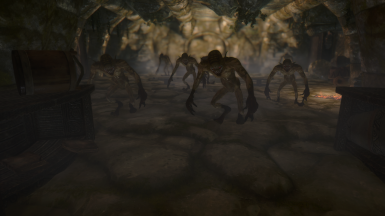 Some of these creatures (specifically the daedric ones) can be summoned via new conjuration books found in certain locations in Skyrim and elsewhere. There are alsomany Guar varieties and references to past and new games for oldschool fans to enjoy. For further details read the sections below, such as the FAQs and Know Issues sections. 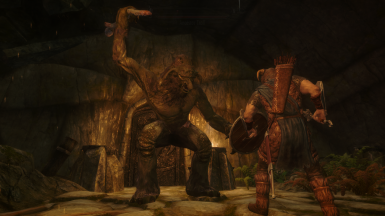 Ancestor Trolls are fearsome and deadly brutes who dwell in the darkest caverns and dungeons of Tamriel. Despite appearances, they are indeed ancient trolls, but unlike their degenerated descendants, they are somewhat more intelligent, being able to craft tools and clothing. 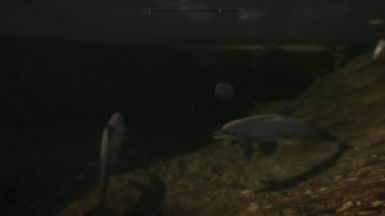 They were last spotted somewhere in Hammerfell in the late Third Era during the event known as the Imperial Simulacrum where many had been mostly wiped out, although the recent dragon epidemic in Skyrim has apparently caused these creatures to return to the surface with increased activity for reasons unknown. The Anglerfish is an unnerving deep sea dwelling fish that uses the luminescent angler-like growth on its head to lure prey. It bears a resemblance to the Lurkers that serve the Daedric Prince, Hermaeus Mora, making some wonder if there is a connection. could inherit the traits of its incubator to produce more useful and stronger hybrids of pre-existing creatures. The results were, as one would expect, catastrophic. Whilst the Cockatrice was produced from an altered chicken's egg hatched by a serpent, the Basilisk was produced from an altered serpent's egg hatched by a chicken. This vicious and feathered serpent is quite rare and its scales are valued for their alchemical uses. Boars are voracious tusked swine that prowl the regions of Tamriel, being able to survive in many environments, such as forests, plains, swamps, rainforests and even the cold regions of Skyrim. They are quite ruthless when pursuing prey and while in combat. They come in many varieties, such as the Bristleback, but the most dangerous and largest is the Wrothgarian Boar which is often referred to as a "Blade Tusk" due to its sharp tusks. There is also the domestic Wooly Boar, also called "Mangalica" in old Nordic, a breed of boar with a thick and fuzzy coat similar to a sheep's. The Daggerback is another breed of boar that has porcupine-like quills along its back. Chub Loons are flightless birds native to the icy coasts of Wrothgar and Skyrim. 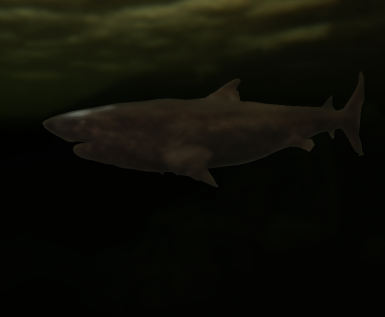 They are expert swimmers who live off of fish and other small aquatic life. Their primary predators are Horkers and Orcas. They used to be commonly eaten by the ancient Nords of Skyrim before the Chicken became more widespread. The Clannfear is a feral beast-like species of Daedra common throughout many of the Daedric Realms and is commonly used by many of the Daedric Princes. Unlike most Daedra, they are no different than animals, having no varieties or members of notable intelligence and seem more like "pets" and "watch dogs" for the more powerful Daedra. 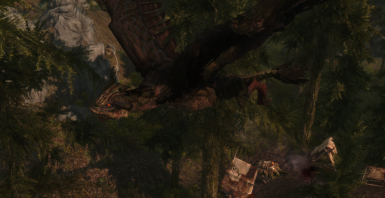 The Cockatrice is a truly peculiar creature from Valenwood with the same unnatural origin of its cousin, the Basilisk. This vicious breed of chimera was spawned from the same experiment that gave birth to the Basilisk to see if (through aid from the school of Alteration) eggs could inherit the traits of its incubator to produce more useful and stronger hybrids of pre-existing creatures. The results were, as one would expect, catastrophic. Whilst the Basilisk was produced from an altered serpent's egg hatched by a chicken, the Cockatrice was produced from an altered chicken's egg hatched by a serpent. This vicious and scaly fowl is quite rare and its meat and eggs are incredibly valuable for both culinary and alchemical uses. The Cyclops was a violent ogre-like menace that lived long ago. The most notable trait of these giants was their single large eye and the horn that grew atop of their heads. 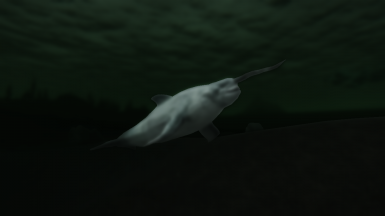 The only remains left of this ancient species were a few decaying bones and a skull discovered by a man named Bardus during the Fourth Century of the Third Era, however these remains have long since been lost as well. 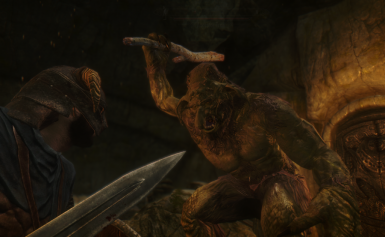 4E 201 - Several reports by those who were near Helgen during the unusual Dragon attack claimed to have seen brown one-eyed ogres and several other strange creatures running from the direction of Helgen. Members of the Synod have been sent out to investigate what might be a startling new discovery. 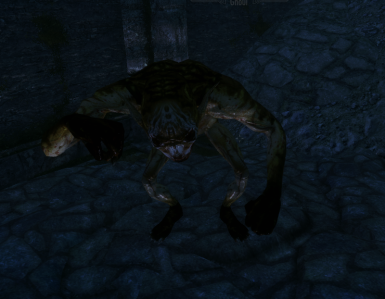 Daedrats are small daedric vermin resembling monstrous Skeevers. Their diseased appearance is even more ghastly than the Skeever and its glowing eyes can send a chill down one's spine in the night. Luckily this creature is one of the weakest daedra known to exist and some are even conjured as pets by apprentice mages. Daedric Titans, or simply "Titans", are legendary and immensely powerful winged Daedra created by Molag Bal during the Merethic Era after subjecting the dragon Boziikkodstrun to horrifically torturous alteration and experimentation, which turned it into the first Titan. Due to the rarity of dragons, Bal could only create a few duplicates of the original first Titan, but they were devastating enough to almost ensure his victory during the Planemeld. Luckily they were all destroyed thanks to the efforts of the Vestige. However some fear that with the return of Dragons, the vampires of Tamriel will try to claim their remains and offer them to their dark master, ensuring the return of these powerful and nigh-unstoppable horrors. Daedroths are crocodile-headed humanoid daedra associated with Molag Bal and Mehrunes Dagon but can be found throughout most of the Daedric Realms and on Nirn. They are savage and animal-like but some Daedroth breeds like the Lesser Daedra have been known to wear armor and wield weapons, suggesting that some varieties are capable of moderate intelligence. 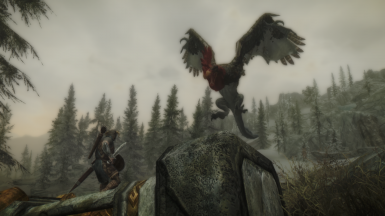 Long ago, a powerful Daedroth created by Hircine, which was known as the Weredaedroth, existed but was killed in battle against Sheogorath's songbird atop the peaks of Skyrim. However its Daedric nature makes some wonder if this horrid creature will eventually reform and return to bring ruin to Skyrim. 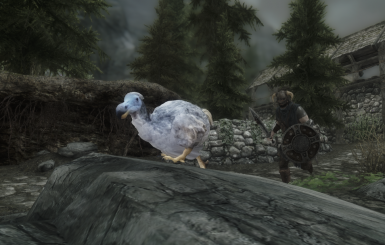 The Dodo is a wild breed of fowl whose meat is incredibly popular among Orcs and Forsworn (especially after The Gourmet praised the bird's meat in a review), but because of this popularity, these birds have been over-hunted to near-extinction, with only a few remaining in Skyrim. Dragon Frogs, the most common of which is the Kindlespit Dragon Frog, are very unique little amphibians from Hammerfell resembling frogs with the wings, horns and fire-breathing abilities of a dragon. 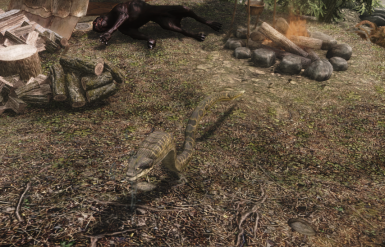 According to the stories of Hammerfell, these little creatures were once dragons who were transformed by an ancient curse, turning them into the almost harmless fire-breathing hoppers we see today. Although the validity of this story is questioned, it is great source of conversation which makes one wonder what ties these little critters hold with the dragons of olde. 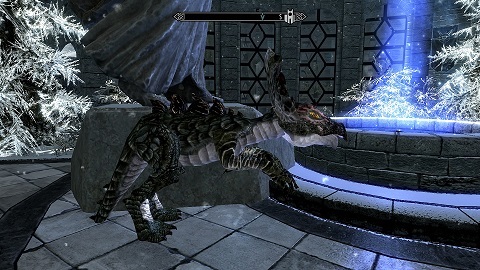 The Dragonling is a small purple dragon-like creature that long ago was believed to be the infantile form of dragons, but recent research has confirmed that there is apparently no connection between them and the Dovah despite appearances. 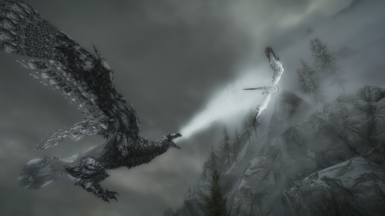 Regardless, they are still strong beasts capable of breathing fire and apparently are intelligent enough to have formed their own language called "Dragonish" which can make them non-hostile to those who can speak their tongue, although what connection this language may have to the language of the Dovah is uncertain. 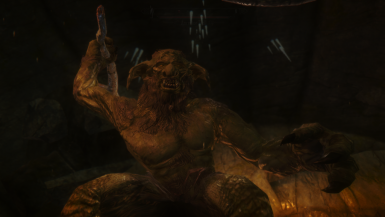 The Echatere are a species of "ugly, mean and pointy" animals common to Wrothgar that are used as both livestock and beasts of burden by the Orcish inhabitants. They are a major source of food and clothing for many orc cities and strongholds and are of great importance to their daily lives, however they know better than to get careless or too attached to these temperamental beasts. 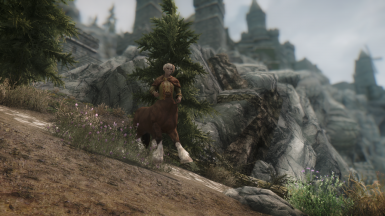 Some Echatere can occasionally be seen inhabiting the Orc Strongholds of Skyrim while a few wild breeds can be found near the northwest borders of Skyrim. The "Ettin" tribe of giants are descendants of those who most loyally served the Giant Warlord Sinmur during the Giant-Companion war. They were one of the last remaining loyal holdouts after Sinmur's defeat, and during a losing battle at their home camp, they prayed to all the daedra begging for salvation. Eventually, Mephala and Boethiah, two of the "ancestor-gods" of the Dunmer chose to answer their dark prayers. 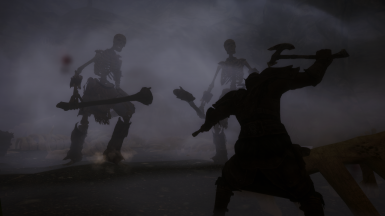 The princes transformed the giants into a new monstrous of immense strength and savagery, with one head having the deadly cunning of Boethiah and the other having the murderous blood lust of Mephala. 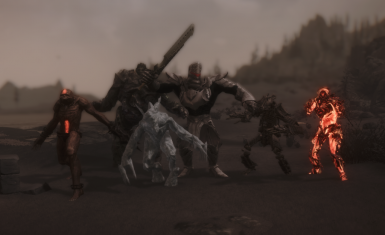 With their newfound might, they easily defeated and devoured the nord invaders, an act which was met with disgust and hostility from both nords and giants, who then united to drive out this new monstrous menace from their homeland and into an unknown location where they have lived ever since. Ages of seclusion and inbreeding have led to a massive decline for this tribe, but they are still just as savage as ever. 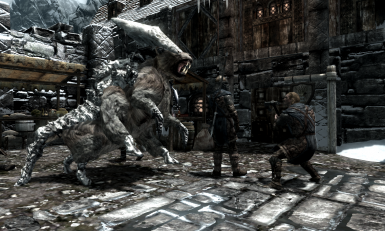 appearances in Skyrim are due to reckless mages seeking to harness the power of these frozen beasts for themselves. Ghouls are hideous creatures resembling the undead who reek of carrion and exclusively live off the rotting flesh of corpses and even consume other forms of undead, such as draugr and vampires. These vile and filthy creatures are quite awful to look at and because of their diet they are riddled with diseases and one bite is enough to infect a victim with the worst illnesses imaginable. They commonly dwell wherever corpses and the undead make their home, such as tombs, crypts and graveyards. They are also not above killing the living and will drag bodies to their lairs to await for delicious decay. They are almost universally despised except by those who do not know of their existence. either the natural elements or honed materials and are then given humanoid form. These artificial constructs are then given life by binding the souls of humans, animals or lesser daedra to them, although the latter is usually preferred due to being more likely to obey orders. They exist primarily to do the bidding of their masters, usually serving as guards or servants for simple tasks, although their use has dwindled in modern times due to the convenience and popularity of Elemental Daedra, such as the ever so popular Flame Atronach. 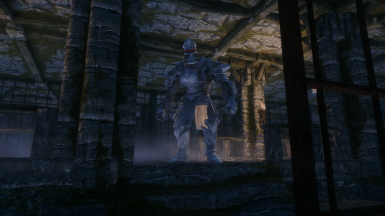 Several kinds of Golems exist, such as Fire Golems (simple golems made of coal and transmuted bones), Stone Golems (who have many variants, such as the Earth Atronach and Foundation Stone Atronach), Iron Golems (a powerful Golem often confused with Dwemer Animunculi who are similar in nature to Golems but far more advanced), Water Golems (creatures made of water contained in a thin layer of enchanted ice) and the loathsome but ever so common Flesh Atronach (hideous lumps of flesh and bone which are made by those who dabble in the darkest arts and are always given Daedric souls, as daedra are the only beings capable of resisting the constant agonizing pain). 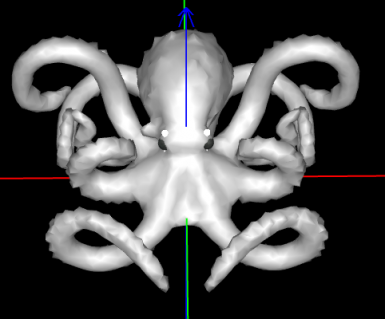 There also exists constructs made from bones, such as Shambles and the Bone Colossus, although it's not always clear whether they are constructs or misshapen revenants back from the dead. Hags are evil witches who have been corrupted by dark nature magic. Due to their advanced age, they are quite powerful and have mastered many of the secrets of their dark arts. 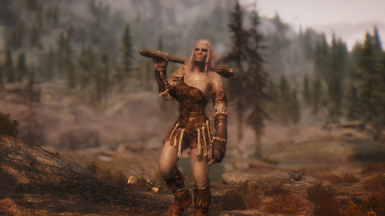 They are a repulsive sight to behold and some may choose to become Hagravens to enhance their power further but only when they have aged enough and mastered all that they can unlike the reckless young "Hags" of Skyrim that have been recklessly participating in the Hagraven rituals as a shortcut to power. Harpies are a carnivorous race of bird-like women. They are a ferocious lot with a fondness for kidnapping, mating and killing human males to keep their race going as they cannot give birth to males. Harpies live in matriarchal societies and can be found in most warm regions of Tamriel. Despite their animalistic behavior, Harpies have a rudimentary intelligence and even have their own language, although they rarely communicate with the civilized races of Nirn. Despite this, some Harpies may occasionally live peacefully in Hammerfell villages alongside men and elves. The Harpy race originally began as human women native to the barony of Lainly in Hammerfell who were cursed for their malicious Daedra worship. To this day, Lainly has the highest population of Harpies in the Illiac Bay. Lizard Men are a race of savage reptilian beings. 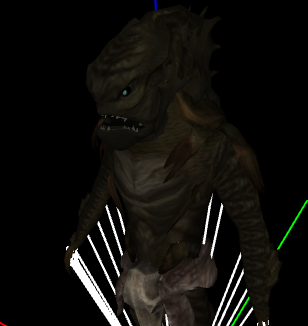 They were once thought to be a primitive tribe of argonians, but it was soon made evident that Lizard Men were not human in the slightest and are merely wild animals who can mimic human behavior, such as weapon usage. However they occasionally show signs of some little intelligence, mainly in the form of a very primitive language that consists mainly of grunts and garbled screeches that are used to tell others of their kind who to kill and where to find prey. They mainly live in swamps and deserts, as well as damp dark caves or dungeons. They can also excrete a deadly poison that can paralyze prey. 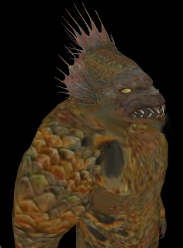 The Mantikora was once a vile chimera created by the alchemists of the Scaled Court during the time of The Alliance War. This creature was an amalgamated centaurian horror with the tail of a scorpion, the scales of a crocodile, the head and body of a wamasu, and a humanoid upper body. This artificial species is believed to have become extinct during The War of Bend'r-mahk. However, sometime after the Oblivion Crisis, an attempted but short-lived revival of the Scaled Court tried to recreate the ancient Mantikora, but due to their own limited supplies they were forced to substitute the wamasu with a Cyrodilic lion and a dragonling, resulting in a vastly different creature resembling a lion with a humanoid face, dragonling wings, crocodile scales and a scorpion's tail; for some reason this new breed of Mantikora is occasionally referred to as a Manticore. 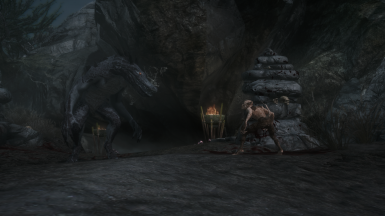 Despite the original's extinction, a supposed sighting of an Ancient Mantikora was reported from the Skyrim-Hammerfell border sometime after the return of Alduin, but whether there's any truth to this claim and what it means, remains unknown. The Musk Ox is a large breed of Ox known for its shaggy and thick fur and especially for its foul musky odor during mating seasons. They are hardier than Cows and are kept in many parts of Skyrim. 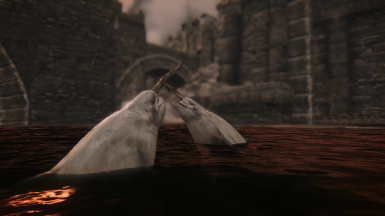 Narwhals (also known as Narwhales) are sea-dwelling whale-like creatures that live in the cold seas of Skyrim and Atmora. They have a long and pointy horn-like tusk which they use in combat with one another and against potential prey. 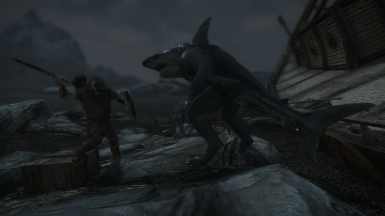 These territorial sea beasts are an important part of Nord culture and many young nord warriors hunt them as a rite of passage, and some even hope to have a chance of taming and riding one of these deadly stabbers, usually with disastrous results. 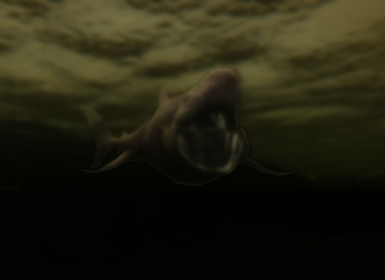 The Orca is a species of sharp toothed whale native to the coasts of Skyrim, Atmora and Wrothgar. They are beautiful creatures whose appearance belies their nature as dangerous predators who hunt all manner of marine life. Their favorite prey is the Horker and Chub Loon which they can even crawl onto land to catch. The Letifer Orca Planta is named after these creatures. Owls are charming birds with wide eyes who are often seen as symbols of wisdom. They are fierce little creatures who enjoy hunting rats and other small vermin, making them a proud part of Skyrim's ecosystem. They are associated with the forgotten nordic god Jhunal and the image of owls were often used on his shrines and amulets. Owls are also depicted on the walls and doors of ancient Draugr tombs, showing that they have been a part of Skyrim since ancient times. The Owlbear is a very strange and rare beast presumably of chimeric origin that hails from Valenwood, but can also be found in Skyrim. They resemble a cross between an owl and a bear, having the overall frame and paws of a bear, but the head and feathers of an owl. These beasts are just as vicious, if not more so, than regular bears and will kill anything on sight, even their own kin. Because of this, they are considered a threat to wildlife and are regularly hunted by Wood Elves. However, some in Skyrim that know of these creatures like to keep Owlbear cubs as exotic pets as they are more effective in exterminating Skeevers than any other creature. The Pumpkin Spectre is a horrid plant creature created by the Hedge Wizards for the annual Witch's Festival. They are pumpkins that have been brought to life via arcane magic and whose vines are shaped to resemble a humanoid's. They exist to torment the innocent on the night of the Witch's Festival, although in modern times some mage's have created their own breed of tame Pumpkin Spectres to serve as entertainers for children on this holiday's night. Rocs are gigantic birds of prey with a taste for anything that moves. These monstrous eagles inhabit the deserts of Hammerfell but they began appearing elsewhere after the Aldmeri Dominion attempted to takeover Hammerfell, with some suspecting that the elves had somehow tamed these creatures to do their bidding, as they are sometimes seen flying over what once were hidden shrines of Talos. Scamps, also known as "The Hounds", are verminous lesser daedra associated with the Daedric Prince, Mehrunes Dagon but can be found in many Daedric Realms and on Nirn. They are vile little creatures resembling a mix between goblin and rodent. They are animal-like and unintelligent beings who delight in cruelty and causing fires with their spells. Despite their unintelligent nature, they are smart enough to have a language of their own (which is actually incomprehensible) and can also follow basic instructions. Because of this, they are commonly used as servants or messengers by mages, although they can be a bit unruly at times. Snails and Slugs are simple little bottom-feeding mollusks that can occasionally be found throughout Nirn's warmer regions, but can also be found in the wilds of Skyrim or in damp locations, such as moist caves or cellars. Snails have rather charming shells that some young boys enjoy collecting while naughtier children use slugs to tease their mas or sisters. 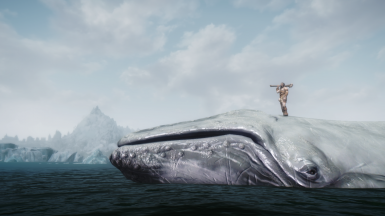 Snow Whales are ancient and gigantic sky-dwelling whales that have been in Skyrim since the Return of Man. They live high above the mountain tops where they mysteriously "swim" through the skies while leaping from cloud to cloud and singing their beautiful ethereal song. The nords of olde hunted these mighty sky beasts with only the bravest daring to take on such a hunt, for it required great strength, resolve and fortitude to survive such a perilous climb and then be prepared to battle the beasts among the clouds. They are a great source of food and resources and it could even be used to produce the finest rosewater and paint for the women. Timber Mammoths are forest-dwelling mammoths native to Valenwood. Unlike their Skyrim cousins, Timber Mammoths are gray with black eyes and are usually far less prone to hostility. Some are even kept as livestock by Wood Elves. 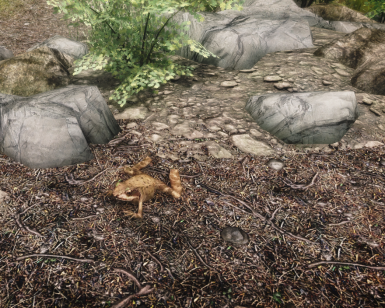 Toads and Frogs are water-dwelling creatures with slimy hides who are common throughout Nirn, mostly inhabiting swamps or warm areas with high humidity. Though rare, a few can be found in the warmer parts of Skyrim. Vermai, pronounced "Ver-may", are eyeless Daedra who are completely mindless and aggressive, willing to attack anything they sense, even those who summon them. They usually serve Mehrunes Dagon and Vaermina, but can also be controlled by very powerful mages such as necromancers. Wasps are tiny but hostile insects similar to bees whose stinger can really leave you sore. They are quite useful as alchemic ingredients. Within Morrowind there also exists a deadlier and green breed of Giant Wasps that are so large they can be used as mounts. 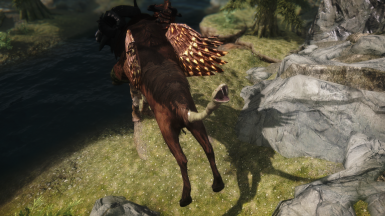 The overwhelming Dunmer migration has resulted in some recklessly bringing these dangerous giant wasps into Skyrim despite the harm they could do to both the people and the ecosystem. 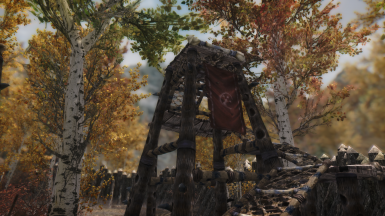 Luckily most wasp farmers are quickly rejected entry or have their wasps killed at the border despite protest, although a few can still be found on the island of Solstheim. Watchers, also known as "Doom-Truths" or "Beholders", are ominous tentacled daedra native to the realm of Apocrypha who serve the Daedric Prince of Knowledge, Hermaeus Mora. Despite their monstrous nature, they are in fact highly intelligent and serve their dark master by traveling throughout the Daedric Realms and Nirn to see and memorize as much information as possible. Outside of Apocrypha, they tend to make their homes in ancient ruins or abandoned buildings filled with knowledge, such as old libraries and will attack any who enter their domain with the powerful energies released from their many eyes. 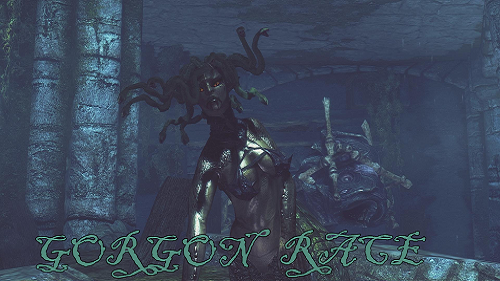 They are a prideful race of daedra who view all other beings and daedra as inferior to themselves, with the occasional exception of their fellow Apocrypha daedra. Lycanthropy, originally known as Therianthropy, is a disease created by Hircine, the Daedric Lord of the hunt which causes the infected to transform into monstrous animals with humanoid traits. Usually savage and deadly, werebeasts are some of the most dangerous creatures in Tamriel and come in many shapes and forms depending on the variant of the disease they've been infected with. The most common and well known are Werewolves and the main reason why the name Lycanthropy is used more commonly. 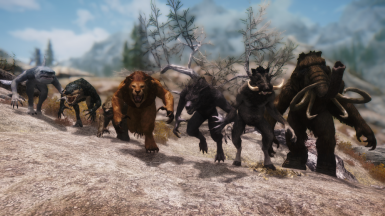 The other known kinds of werebeasts are the Werebears of Skyrim, the Wereboars of High Rock, the Werelions of Elsweyr, the Werecrocodiles of Black Marsh, the Werevultures of Valenwood and the elusive Weresharks supposedly of Pyandonea. 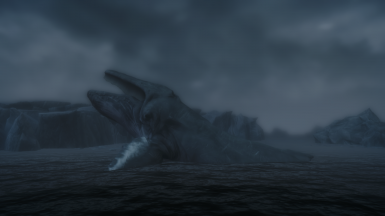 Whales are ancient and gigantic aquatic creatures that dwell deep within the seas of Nirn but occasionally some may be seen breaching near the coasts of certain regions of Tamriel, most especially Skyrim and Wrothgar where they sing their ethereal song. They are occasionally hunted by mighty whalers in large vessels. 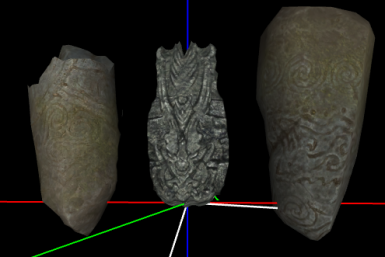 Whales were once revered in Skyrim by the ancient Nords as one of their sacred animals and their bones would be used as building materials in sacred sights. 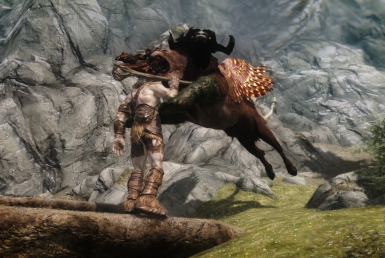 In modern times though, they are hunted for their bountiful amounts of meat and resources, but the natives of Skyrim remain ever grateful to this majestic beast's bounty. Snow Whales are their sky-dwelling counterparts who are just majestic (if not more so) but are a far more difficult to hunt. 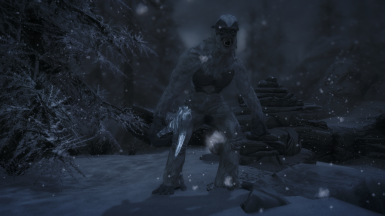 Yetis, also known as "Abominable Snowmen" by the Nords, are a very rare breed of beast believed to have been introduced to Tamriel during the third Akavir invasion by the Kamal emperor Ada'Soom Dir-Kamal to aid in his conquest of Skyrim's cold tundra. Some nord scholars have theorized that these creatures may have originally been denizens of Old Atmora in times long past who were abducted by the Kamal. 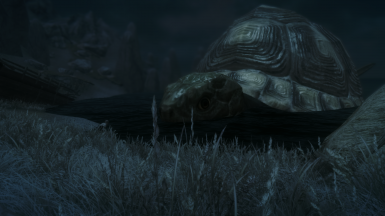 The rarity of these creatures is suspected to be due to an attempt by ancient Nords to wipe out all traces of the Kamal presence from their homeland. Some have also suggested that these creatures may have some connection to Frost Giants and Frost Trolls, but this is not certain. Drag and drop the contents of the Data folder in the rar file into your Skyrim Data folder. 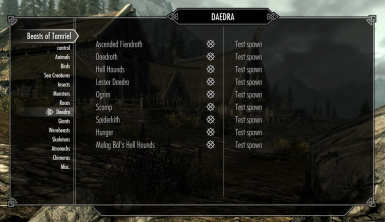 The mod requires Dawnguard, Hearthfire and Dragonborn to work. No exceptions. SKSE, SkyUI, and FISS are optional but will improve your configuration menu experience. Guars have a few issues when ridden and when killed but they aren't too noticeable and hopefully we will have it fixed for the next update. They also tend to roar when fast traveling to their locations as they use the werewolf animation. Some tamed echatere are a bit unpredictable in behavior. Will hopefully be fixed in the next update. Mod may have compatibility issues with mods that edit Bannermist Tower and Lost Prospect Mine too heavily. Q: Will you be adding an MCM option so that we may be able to accept which of beasts we want? 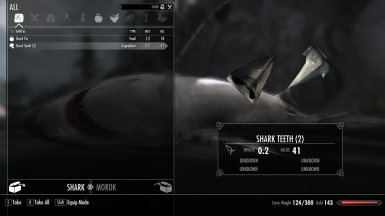 Q: Are they replacing beasts from vanilla Skyrim or Immersive Creatures? use both this and my wereboar mod at once without issue despite both having wereboars. Q: Is it compatible with other monster mods? A: As long as you have Wryebash to make bashed patches for your mod. There is also a patch available for SiC users who don't know how to use Wryebash. 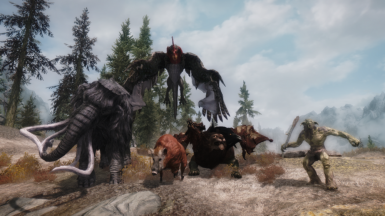 It is called Skyrim Immersive Creatures Beasts of Tamriel patch by mrjentipede. Q: I don't like these creatures!/They're not in my personal definition of what is lore-friendly! A: Then use the config menu to disable it! But all the creatures with the exception of two are lore-friendly and can easily fit into the story if you keep an open mind and can easily be dismissed as Chimeras, which are in fact canon to the lore as read in De Rerum Dirennis and if you know they're lore-friendly but think they don't belong in Skyrim then maybe they were illegally brought in by poachers or nobles, or magically summoned. If you don't like the creatures we worked hard to make even if they don't fit into your own personalized definition of what is lore-friendly, then too bad. Any comments that complain too much on this subject will be deleted. Sorry if this seems harsh but we get more than enough of that here and in our private messages. Please show them your gratitude by checking out and supporting their work. 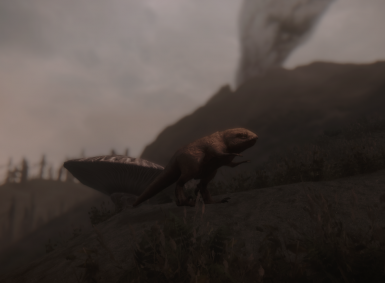 Before using any assets from this mod, contact us first for details on which creatures you want to use and whether or not permission will be given. If a specific creature you want to use belongs to one of the resource providers in the credits make sure to contact them as well and give them the credit they deserve. Some mods that I think compliment this one pretty well or that I just personally use with this one. If compatibility issues arise, use WryeBash and always experiment with your load order. If incompatibilities do arise with certain major mods in the future that edit the same cell, let us know and we'll try to make patches. 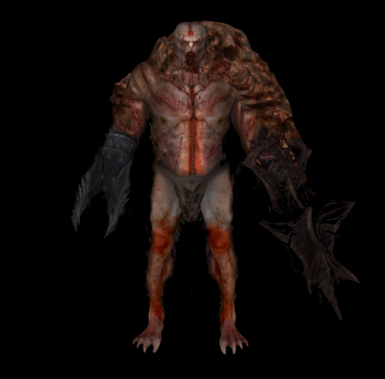 Also try out any other monster mods if you want with this one, but most importantly (if you can) please try the mods by the people in our credits as they are great modders with great contributions. And finally, make sure to check out some of the other mods by me and jboyd4.